It may come as a surprise to learn that not only is rodeo an organized sport in some colleges, but there are also scholarships available to support students who are involved in that activity. Many of these scholarships are designed not for rodeo stars, but for rodeo contributors who show a genuine love for the sport. As one scholarship application from Northeastern Junior College put it, “We wouldn’t be saying much about the quality of academics if we pulled your scholarship if you missed a calf, knocked over a barrel, or fell off of a bull,” which perfectly expresses the plain-spoken spirit of collegial participation desired. The Daniel Parker Herd Scholarship gives preference to those who enter the team roping event and take part in rodeos hosted by the National Intercollegiate Rodeo Association (NIRA). You must attend school full-time (at least 12 credit hours) and be an active member of the NIRA. The Town and Country Bank Scholarship and the Alex Price and Ruby B. Fambro Scholarship, in the amount of $500 each ($250 a semester), both have the following requirements: you must be in the top quarter of your high school graduating class, have an acceptable score on either the ACT or SAT, and have at least a C plus high school GPA. To renew, you must maintain a GPA of at least 2.5. The Jana Williamson Academic Scholarship is reserved for women, and it brings $1,000. The criteria are as follows: you must have graduated from high school in the top quarter of your class, you must have scored at or above a 19 (ACT) or 850 (SAT), and kept a B average in high school. To renew, you must have a 3.0 average, and to apply, you must attend full-time and belong to the NIRA. The Joe Fambro Rodeo Scholarship and the Beulah Brown Scholarship both require you to be an active NIRA member as well as a full-time student. 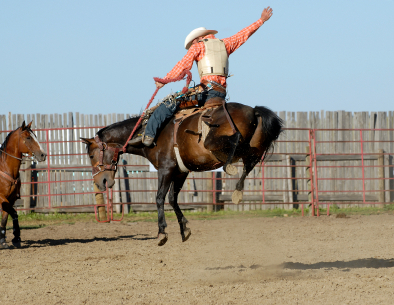 Trinity Valley Community College, which has its own program of rodeo activities, offers a special scholarship for its rodeo participants, and you should submit your application before May 1 to receive preference. The primary criteria for judging your application are your work ethic and character as revealed in the reference letters you present, your record in school and in athletic endeavors, and your financial need. Individual scholarships are awarded in varying amounts. The Mike Cervi, Jr. Memorial Scholarship goes to a student who takes a professional interest in agriculture and either competes in college-level rodeo events or works with rodeos in some capacity. For this award, you must have a good scholastic record and if you have financial need, that will merit consideration. The award is potentially renewable. The G. Bill Atchison Memorial Scholarship is for an excellent student who majors in equine science and participates in both rodeo and judging horses. You must demonstrate a variety of interests that will help you succeed in a horse-related career, and must be active on campus. tuition, books, housing, and food. You can find information about the rodeo program and scholarships here. In selecting scholarship recipients, not only your performance in rodeo events but also your academic record, dedication to the sport, and attitude are taken into consideration. For your application to receive priority, you must turn it in before March 1. The Bill Robinson Memorial Scholarship goes to winners of the steer wrestling, calf roping, and breakaway roping events at the College National Finals Rodeo (CNFR). The Ellen Backstrom Memorial Scholarship is awarded to the winner of the CNFR “hard luck” prize. Two scholarships are given to the “Rookies of the Year” (one of whom is male and the other female). The NLBRA/Wrangler Academic Scholarship, which provides two $2,000 awards (one for a boy, one for a girl) and four awards for $1,000 each. You must be a high school senior who has competed for three years as an NLBRA member. The Rainwater Memorial Scholarship also requires three years of NLBRA membership, you must now be in NLBRA’s senior division, and you must have a 3.0 GPA. There are four awards of $500 made each year. The Sarah Fleming Memorial Scholarship ($1,000) goes to a girl who loves rodeo and working with younger members of the rodeo organizations, and wants to make a career in teaching or early childhood development.